Buy one. Just buy one. It's as simple as that. 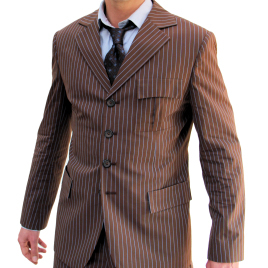 Having already owned a suit off the overstock store I slowly began wanting a suit custom made to my measurements. As soon as I found out that Magnoli had updated the fabric to be even more screen accurate, I jumped on a new suit. The old fabric was very good. The new fabric is incredible! As always, the construction of the suit is beautiful. I had to take it to be altered slightly as it was a bit too big, but I blame my measurements for that. If you're considering buying this suit, what are you waiting for? !